This is the new level 5.9 axle/hub set similar to the level 5 system but with a major upgrade, the inner c.v. Driveshaft Shop now has created a Pro-Level Race worthy system that works with the standard spline size on the differential end, you can now use the System with Quaife and other aftermarket limited slip diffs and spools. 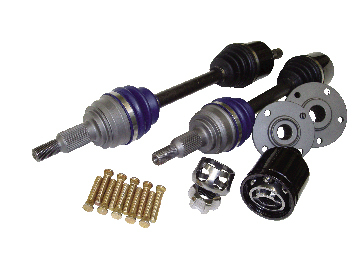 What Driveshaft has done is make a new ball & cage inner c.v. made from high quality chromoly. This inner C.V. now has 6 contact points and is stronger than a Porsche 930 (108mm) c.v. (same .v. used by many high dollar systems)This along with the 33 spline outer and 36 spline bars makes it the strongest set of axles to date. The Kit comes with both axles a set of custom hubs that will only fit the larger bearing sizes (click back button and see link for more hub info) the kits also comes with long ARP studs. The system is designed for 1000WHP and tire size will not effect its strength. This system DOES NOT come with ABS rings, If you would like ABS rings installed it would be an extra cost, please call if needed. Comes with 1 year warranty.